After reading previous post on the D3 R&D, Dario Valenza , builder of the new Paradox sent additional feedback to the interview we made a few months ago. They might be the only ones of the new designs using L rudders against the now almost standard Winglet setup. But just like the Americas Cup new concepts, is all to be seeing and proven this season in the only and final valid measure: The Racing Course. "Our foils have the greatest lifting surface right under the hull. As soon as the hull rises, the lift starts decreasing, encouraging ride height to settle. The rate at which this happens, controlled by foil curvature and twist, is the key to the concept and is vital for heave (ride height) stability. Paradox is designed to be pushed hard without needing to continuously correct ride height manually. This means the sailor can concentrate on the race instead of trying to prevent the boat from jumping up or burying. 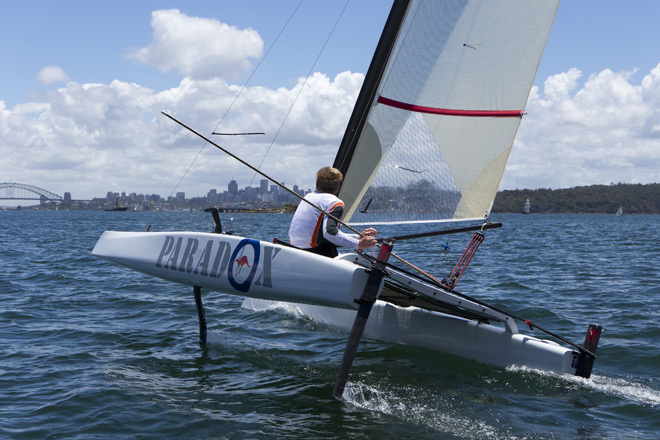 Automatically reducing lift once up on the foils also reduces drag when foiling. The new Scheurer boards have an outward inflection at the top to make the foils more upright as they are pushed fully down. This reduces lift for upwind (lower speed) sailing. Here our foils are similar but our geometry allows this effect to be more pronounced as there is room for a greater change in angle before approaching the maximum beam limit. Our L rudders are designed to provide a sufficiently strong negative feedback on the trim angle for good pitch stability. They do not only provide pitch damping but a real negative feedback leveling the attitude of the boat. The lower part of the rudder is not horizontal. It is angled to complement the foils in three dimensions. By having a single surface instead of two intersecting surfaces (as with T or + rudders) the junction drag is significantly less. 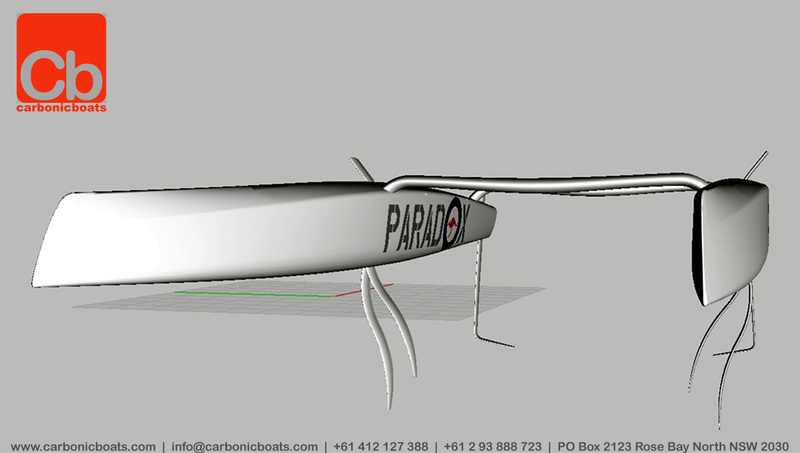 Also we can place the rudder blades further outboard which is beneficial. Hopefully this will help interested observers to understand the different approaches being developed. It will certainly be very interesting to observe the new concepts in competition."